Christmas is most busiest time of the year and perfect for the family and friends to re-connect and celebrate the season's different festivities. However, the preparation can feel overwhelming, as there seems to be an endless list of things to do and never enough time to do them. With the current state of traffic nowadays, both on the road, as well as the foot traffic in malls, restaurants, and almost every public place imaginable, it can be quite a challenge to even begin to imagine how you can get through your to-do list. 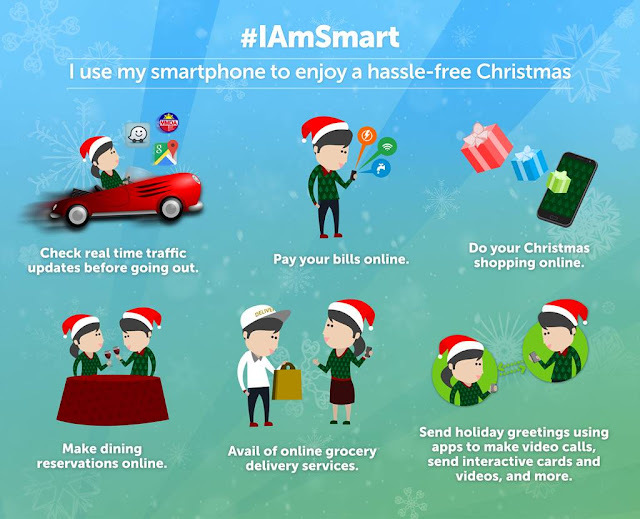 Thanks to the convenience of technology, however, our smartphones can actually help us manage and deal with our Christmas preparation, all with just a swipe, click, and tap of some apps. Smart shares some smart tips that can help you enjoy a hassle-free holiday. For more #IAmSmart tips, go the Smart Communities Facebook page at facebook.com/SmartCommunities.